Gyeongbokgung Palace and Deoksugung will appeal to museum buffs. Your cultural itinerary includes sights like Cheonggyecheon Stream and Changdeokgung Palace. The adventure continues: get a taste of the local shopping with Myeongdong Shopping Street, wander the streets of Bukchon Hanok Village, contemplate the long history of Namsangol Hanok Village, and don't miss a visit to Insadong. To find maps, more things to do, other places to visit, and tourist information, read our Seoul trip planner . Rio de Janeiro, Brazil to Seoul is an approximately 31-hour flight. You can also do a combination of flight and train. Traveling from Rio de Janeiro to Seoul, you'll lose 12 hours due to the time zone difference. Traveling from Rio de Janeiro in April, you will find days in Seoul are a bit cooler (20°C), and nights are much colder (9°C). 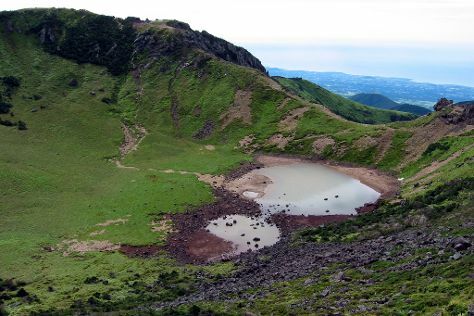 Finish your sightseeing early on the 1st (Tue) so you can travel to Jeju. You'll get in some beach time at Gimnyeong Seonsegi Beach and Woljeongri Beach. Museum-lovers will get to explore Hallim Park and Jeju Folk Museum. When in Jeju, make a side trip to see Seongsan Ilchulbong in Seogwipo, approximately 1h 20 min away. Next up on the itinerary: take a peaceful walk through Hallasan National Park, explore the fascinating underground world of Manjanggul Cave, contemplate in the serene atmosphere at Gwaneumsa Temple, and tour the pleasant surroundings at Gwakji Gwamul Beach. To see ratings, reviews, other places to visit, and more tourist information, read Jeju driving holiday planner. You can fly from Seoul to Jeju in 3.5 hours. Alternatively, you can do a combination of car and ferry; or do a combination of train, taxi, and ferry. Wrap up your sightseeing on the 6th (Sun) early enough to travel to Busan. 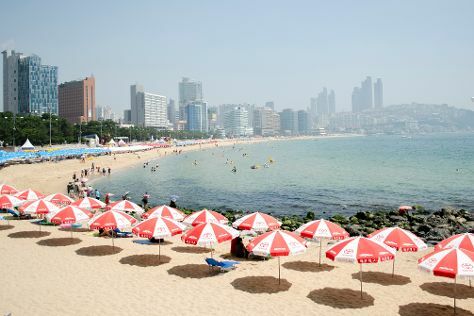 Start off your visit on the 6th (Sun): tour the pleasant surroundings at Gwangalli Beach and then stroll through Haeundae Beach. To see maps, other places to visit, and tourist information, you can read our Busan trip itinerary planning website . Traveling by flight from Jeju to Busan takes 3 hours. Alternatively, you can do a combination of ferry and car; or do a combination of ferry and bus. In May, plan for daily highs up to 28°C, and evening lows to 16°C. Wrap up your sightseeing on the 6th (Sun) early enough to travel back home.